Our state-of-the-art dental suite has been designed around your complete comfort. Honeysuckle Dental is a modern, purpose built practice with a high standard of clinical care and compassion. From our practice here in Honeysuckle Drive, Newcastle, we offer our patients the full spectrum of dental treatments. Here at Honeysuckle Dental we make use of all the latest and most up-to-date dental technology including digital x-rays, dental lasers and virtually pain free dental treatment solutions. We are a paperless dental practice and we pride ourselves in treating our patients safely and efficiently. The team here at Honeysuckle Dental maintains an extremely high standard of infection control with the miele instrument washer. Our practice is an open planned practice incorporating the use of French lights that give our practice an organic, natural feel. 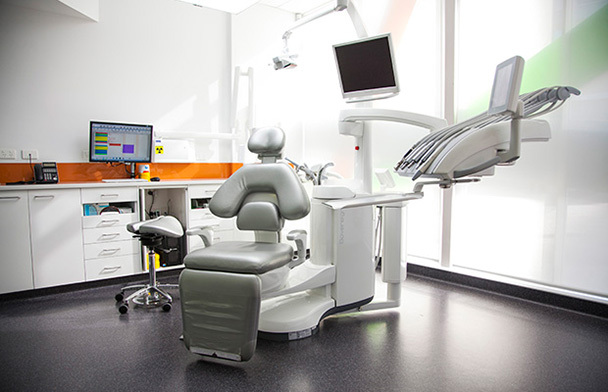 We treat patients in the Sovereign dental chair to ensure exceptional comfort during dental treatments. Our modern purpose built practice provides the fine balance between excellent use of technology and friendly care. The team here at Honeysuckle Dental are here to help. So whether you are looking to restore your smile or coming for your regular dental visit, you can be assured that you are in capable hands with our dental professionals. If the idea of a dental chair causes you anxiety, then you may benefit from our sedative options. We understand that a visit to the dentist may not be everyone’s idea of a fun time, especially if it makes your nervous or causes you fear. However, we don’t want that fear and anxiety holding you back from achieving your optimal dental health. Through our virtually pain free and sedative dentistry options, you can visit the dentist in a calm and relaxed manner. Your teeth are moving all the time. That’s why it’s recommended that people visit the dentist once every six months. Your teeth can develop oral problems at any time, however, sometimes these issues do not become physically apparent until late stages. A dentist will be able to identify these issues earlier due to their trained eye. Often, they will be able to recognise any dental issues and recommend treatment before it becomes too serious. Here at Honeysuckle Dental, we offer a variety of treatments that include but or not limited to: restorative dentistry, laser dentistry, cosmetic dentistry, general dentistry and preventative treatment, endodontics, dental implants and fast braces. You can explore all of our treatment options right here on our website. Of course, routine dental visits aren’t the only thing you can do to take care of your teeth. Having a proper dental hygiene routine is an important factor in maintaining not just your oral health, but your general health as well. By brushing, flossing and having a teeth friendly diet, you can greatly improve and maintain the health of your teeth. If you are unsure of how to best take care of your teeth, then feel free to explore our website or even contact us to learn more about oral health education.